We’ve just about reached peak smartphone. Every premium handset out there is incredibly powerful, has a beautiful display and a pretty solid camera. So where do we go from here? If you’re Lenovo, you let the customer decide. That’s the idea behind the company’s new Moto Z and Moto Z Force. 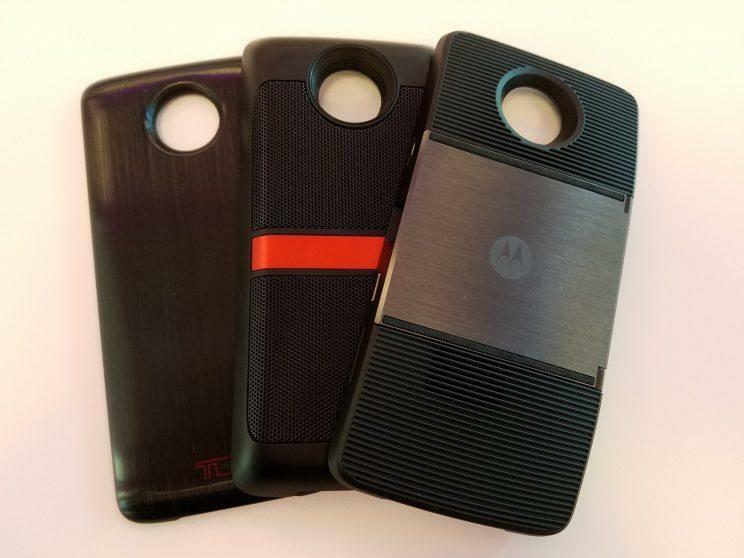 Available for Verizon, the Moto Z Droid Edition and Moto Z Force Droid Edition, which cost $624 and $720, respectively, are part of a new crop of pseudo-customizable handsets called modular phones. The idea is to let you add features to your phone by snapping on special attachments. So rather than just being your “Pokémon Go” machine, the Moto Z can double as a mini projector or a high-performance speaker. It’s some impressive technology, but it’s also rather pricey. Let’s talk about the phones first, though, shall we? The Moto Z and Moto Z Force are largely the same smartphone. They have the same styling, the same size and type of screen and support the company’s Moto mods. But there are subtle differences between the two that account for their $100 price difference. The Moto Z Force is both thicker and heavier than the Moto Z thanks to its larger battery. The Z Force also gets a 21-megapixel camera, while the standard Z gets a 13-megapixel shooter. On top of that, the Z Force comes with Motorola’s ShatterShield display, which helps prevents it from breaking when you drop it. 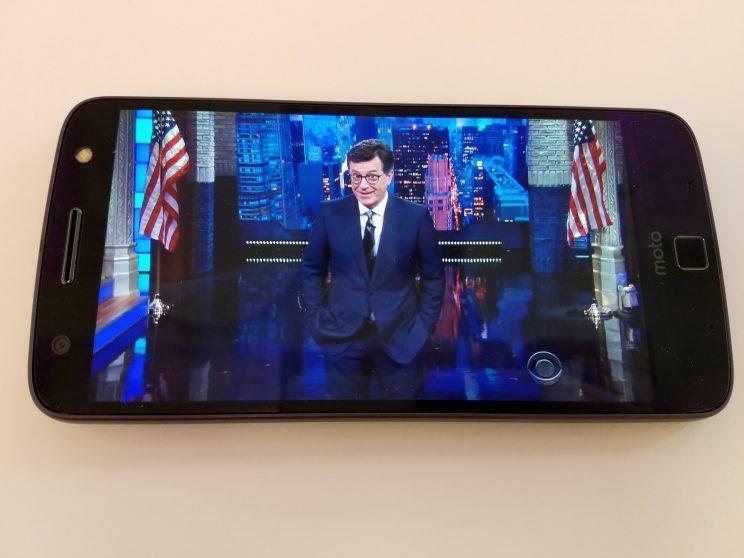 The Moto Z, for its part, is stunningly thin. At just 0.20 inches, the Moto Z is thinner than both Apple’s iPhone 6s (0.28 inches) and Samsung’s Galaxy S7 (0.31 inches). The Moto Z Force is 0.28 inches thick. The Z is so thin you’d think it’d feel flimsy, but thanks to its aluminum and steel body, it’s surprisingly rigid. Unlike the Galaxy S7 and iPhone 6s, the Moto Z and Z Force don’t have physical home buttons. Instead, they use digital home, back, and recent apps buttons. The phones’ fingerprint sensors are just that and nothing more. But they really look like they should be home buttons. So as a result, I kept pressing them without even thinking. Call it force of habit. 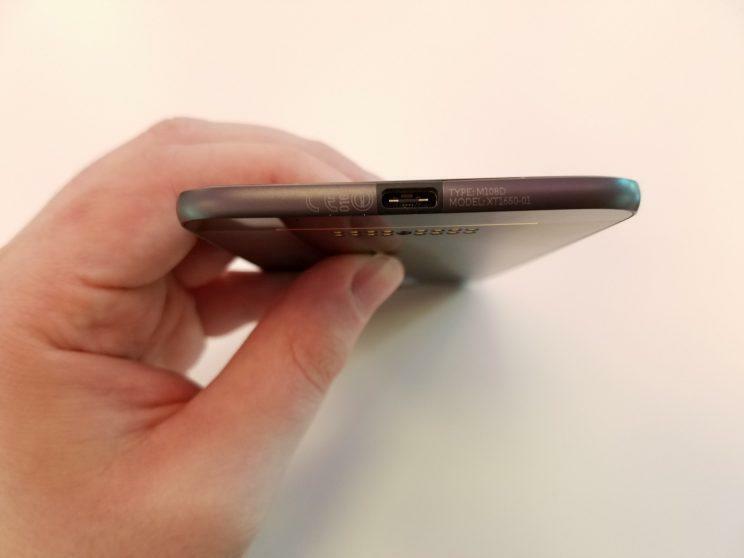 Probably the most significant design feature of the Moto Z and Moto Z Force is what they’re missing: headphone jacks. Yes, the lowly 3.5mm port is going to that big tech dump in the sky. Taking its place is the new hot port on the block: USB-C.
You’ve probably heard rumblings that Apple is considering ditching the 3.5mm jack for the iPhone 7 and will instead offer headphones that connect to the phone’s Lighting port. In the case of the Moto Z and Z Force, you’ll have to either buy a pair of headphones that support USB-C, or use the phones’ included USB-C to 3.5mm converters. Why bother killing the 3.5mm jack if Motorola included a converter cable anyway? Because by doing so, the company was able to trim the Moto Z’s thickness enough to make it one of the thinnest phones on the planet. The first big-name modular smartphone to hit the market was LG’s G5. That phone let you pull off its bottom panel and add on attachments that improved its speakers or turned it into a point-and-shoot camera. 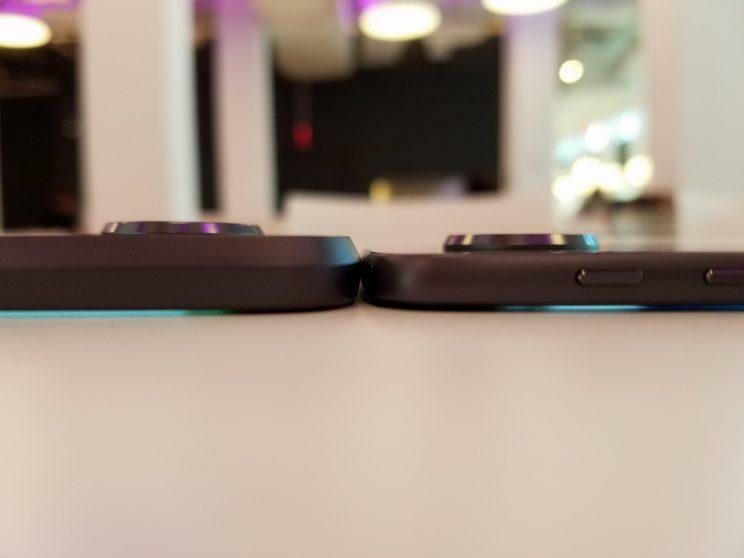 The Moto Z and Z Force offer a slightly more elegant solution: magnets. Instead of pulling the bottom of the phone off, you simply attach your mod to its back panel via a series of connector pins and the magnets, which are hidden, keep the mod in place. So far, Motorola is selling three mods for the Moto Z and Z Force: a mini projector, a speaker and a battery pack. 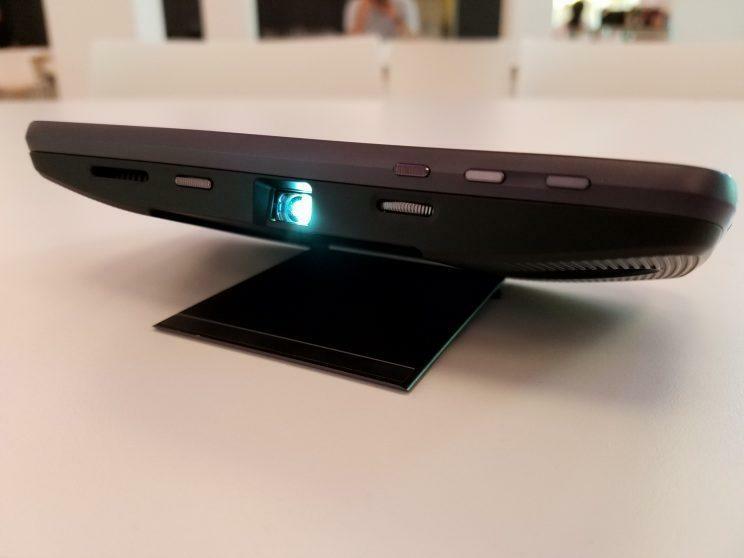 The projector, which Motorola calls its Moto Insta-Share Projector, includes a build-in stand and can throw an up to 70-inch image on your wall. You can manage the screen’s brightness and focus manually. The projector also has a built-in battery that should get you through at least one full-length movie, so it won’t kill your phone while you stream. I used the projector in my bedroom to cast Netflix onto my white wall, and it looked surprisingly clear. It won’t replace a solid high-def TV by a long shot, but it sure made my old 20-inch set look outdated. Don’t try using it in a well-lit room, though, as your image will be overwhelmed by the ambient light. In addition to the projector, Motorola is also selling its JBL SoundBoost speaker. 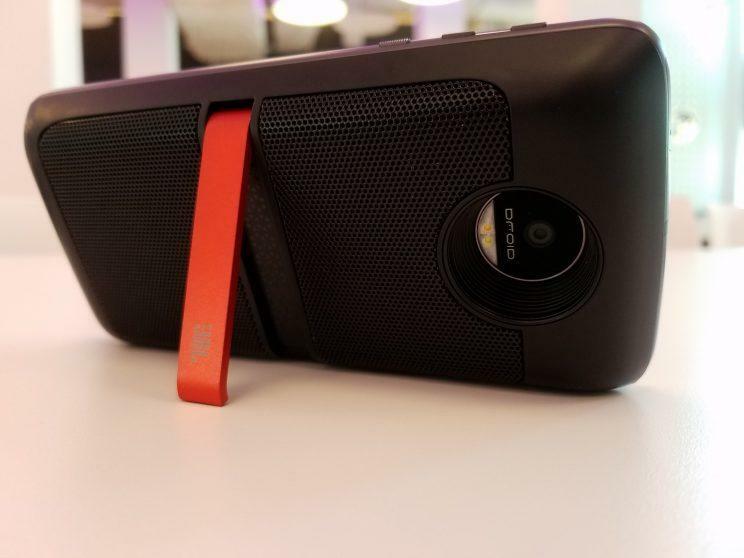 Like the projector, the speaker attaches to the rear of the Moto Z or Z Force and its performance is genuinely impressive. Audio from the SoundBoost was clear and offered plenty of bass. Here’s the thing, though: the mods are pricey. The Insta-Share Projector will cost you an extra $300 in addition to the price of your Moto Z and Moto Z Force. The Boost speaker, meanwhile, is $80. What’s more, the mods add considerable heft and bulk to both handsets. 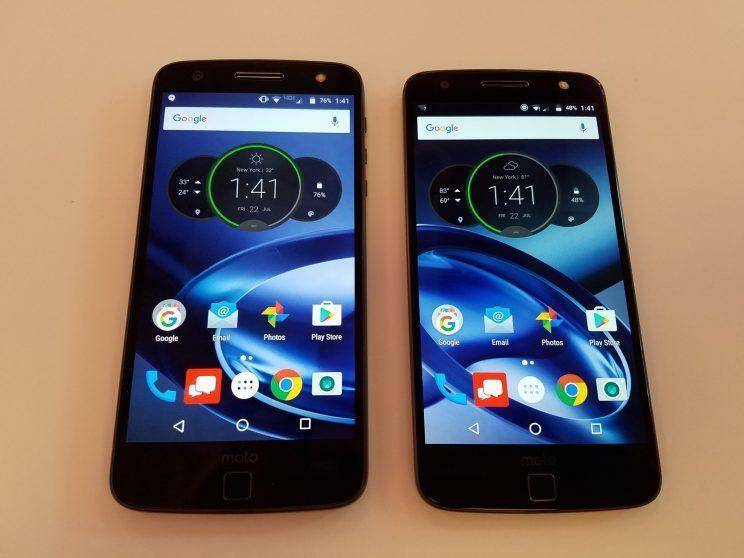 The Moto Z and Moto Z Force both sport 5.5-inch, 2560x 1440 resolution AMOLED displays. And those displays are beautiful. Colors look absolutely gorgeous and blacks are inky and deep. The screens on both phones are larger than the Galaxy S7 and iPhone 6s, which have 5.1-inch and 4.7-inch displays, respectively. Samsung’s larger phone, the Note 5, has a 5.7-inch screen, while the iPhone 6s has a 5.5-inch panel. More interesting is the Moto Z Force’s ShatterShield panel. Originally debuted on Motorola’s Droid Turbo 2, the ShatterShield display is about as shatterproof as a smartphone’s screen can get. You can throw this phone down a flight of stairs and its panel will get scuffed and marked, but it won’t break. The Moto Z, on the other hand, has a Gorilla Glass panel, which is stronger than standard glass, but isn’t as tough as ShatterShield. Motorola’s Moto Z and Moto Z Force have two different types of cameras; the Moto Z has a 13-megapixel shooter, while the Force gets 21-megapixels. Motorola’s phones have never had the greatest cameras, but the Z and Z Force are the exceptions to the rule. First, both capture photos that are equally clear. Color is a bit dim compared to the Galaxy S7’s camera, though that’s the best smartphone camera on the market. My one gripe with the Moto Z and Moto Z Force’s cameras is that they tend to make colors look blown out when taking photos near bright lights. 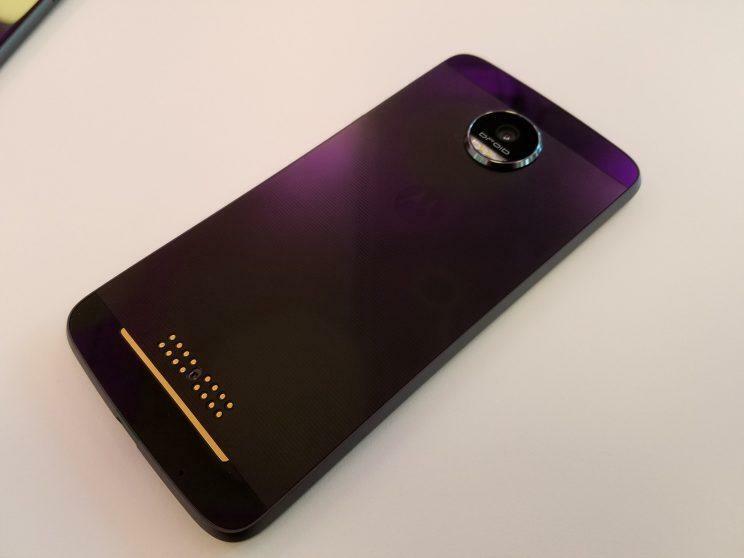 Both the Moto Z and Moto Z Force come equipped with high-powered quad-core processors, 4GB of RAM and 32GB of storage space. If you end up running out of storage, you can pop in a microSD card and BAM, you’ve got more space. As for battery life, the Moto Z will get you about a full day of battery life, while the Z Force will go even longer. When you do run out of power, though, you can plug in their quick-charging chargers to get up to 8 hours of battery life in 15 minutes. Unlike most Android smartphone makers like Samsung that alter Google’s mobile operating system, the Moto Z and Z Force run largely stock versions of the OS. That’s a welcome change for purists and makes updating your phone easier when the newest edition of Android is released. Unfortunately, Motorola and Verizon fill their phones with tons of unwanted software including games and Verizon apps that simply take up space. The Moto Z and Moto Z Force are powerful smartphones with beautiful displays and attractive designs. The biggest asset of both phones is their Moto Mods — while they’re an enticing addition, they’re also pricey. I also wish the phones didn’t come loaded with so much bloatware and that their cameras were just a bit better. Overall, these Moto Z and Moto Z Force are above average phones with the ability to be even more than that. You’ll just have to spend the cash to get them there.